Congratulations are in order! The5 — a.k.a. the region’s most popular (only?) 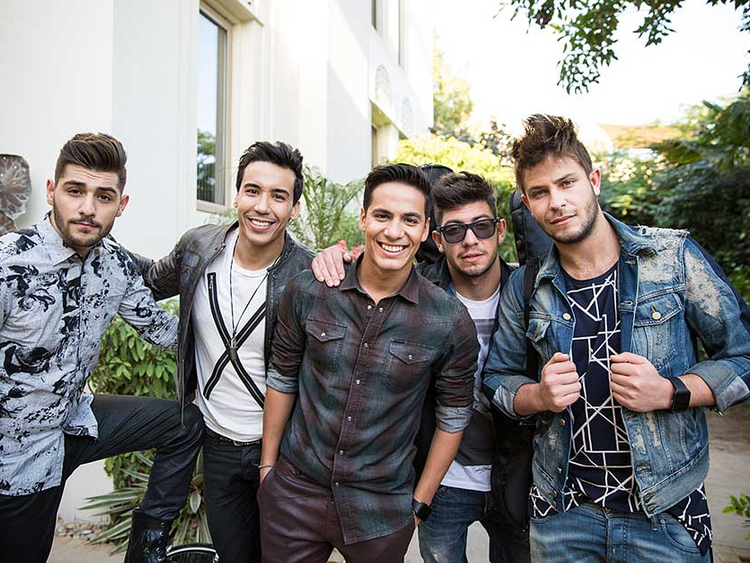 boy band — won big on Saturday night, snagging the title of Favourite Arab Act at Nickelodeon’s Kid’s Choice Awards. To make things a little sweeter, they’re the first winners in the new category. High five, boys. Ahmad Hassan (Egypt), Said Karmouz (Algeria), Adil Echbiy (Morocco), Mohammad ‘BMd’ Bouhezza (Algeria) and Kazem Chamas (Lebanon) beat out Palestinian sensation Mohammad Assaf, X Factor winner Hamza Hawsawi (Hawsawi beat The5 on the X Factor last year) and teenage pop star Hala Al Turk. The ceremony will air on Nickelodeon Arabia on Wednesday at 7.35pm with a special thank you message from the guys. Ahead of their win, they talked to tabloid! about their favourite cartoon characters, their dream super powers and what they were like when they were kids. Ahmad: It’s great. Thank you! Can you tell us what you’ve been working on lately? Said: I’ve actually been out of action with a broken foot recently. But we just released a special acoustic track with Anghami, Bel Gharam (Anghami Sessions). We’re about to work on our album at the moment. What was your favourite cartoon growing up, and why? Ahmad: Detective Conan [Case Closed] — I loved the mystery and how you’re always thinking about what will happen. Adil: Detective Conan [Case Closed] — I’ve watched every single episode, and I would always try to work out who the criminal was before the end of the show. Said: Yu Gi Oh! Such a mysterious character. Kazem: Donald Duck, he was always so annoyed and frustrated, it made me laugh so much. BMd: Dai Echo Udjaa or Dragon Quest. It gave me lessons about strength and friendships. It was the most exciting cartoon ever. How would you describe yourself as a kid? Ahmad: I was very naughty and playful. Adil: I was a clever kid, but very shy, and very emotional! I spent a lot of time daydreaming, too. Said: I was extremely shy. I didn’t talk much, so I didn’t sing either. Kazem: I was silly, fun, always joking around and laughing. BMd: I was smart. I studied well and at the same time I was a cool kid. I was a basketball player and a bad boy at times. What was your favourite age to be and why? Ahmad: When I was six — it was my first time to sing in public. Adil: My favourite age was 10, I started singing then and learned to surf in Morocco! It felt so free, I was a very happy child, and that’s where it all began for me. Said: Eight. I started playing basketball and fell in love with it, it brought me out of my shell and helped me become less shy. Kazem: 13. I used to play street football every day with all the kids in the neighbourhood; those were such good times. Go Brazil go! BMd: 15 to 18 — during high school. It was an amazing time. I was a little bit famous because I used to rap and freestyle all over the school. Also, the fact that I was good at basketball made my life awesome in high school. Ahmad: Captain Majid. I love playing football. Adil: The masked tiger. He was a fighter. BMd: Timmy Turner — Fairly Odd Parents. Cosmo and Wanda made all wishes come true. If you were a superhero, what would be your superpower? Adil: I’d want to be able to talk to animals like in the cartoons! Or fly, who doesn’t want that super power, right? Said: Mind control! The power to move things with my thoughts. BMd: Flying and having supernatural strength. It’s 2016 — what are your resolutions for this year? Ahmad: Finish our album and go on a world tour. Said: I think I should try not to break any more bones ... Besides that, I want us to record a great album and take The5 to the next level. Kazem: Besides working with The5 this year, I’m studying in a music conservatory learning languages and getting fitter at the gym. BMd: We as a band are planning to live in one country soon as well as start working on our first album. What would it mean to you if you won the Kid’s Choice Award for Favourite Arab Act? Ahmad: It’s an honour for us! We finished The X Factor a few months ago and then now we’re nominated for this international award. Adil: It would be wonderful. To know that the kids from this region and all over the world are supporting us makes it all the more special. Said: Honesty, I grew up watching the Kid’s Choice Awards, to win would be a dream come true.